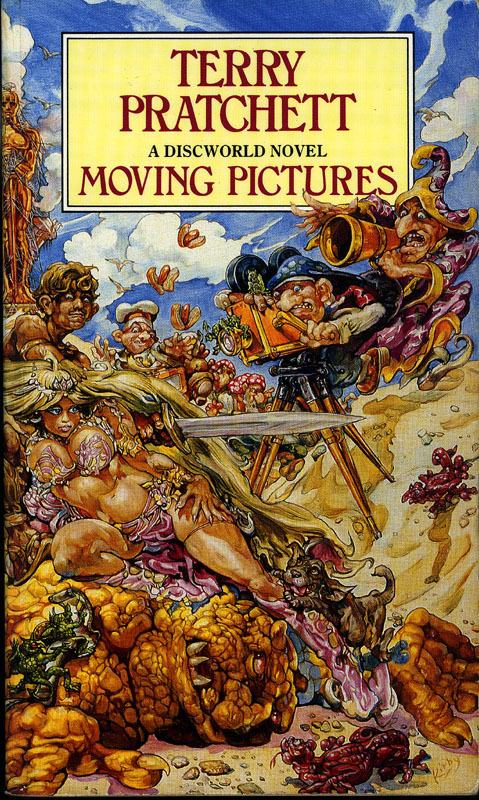 And we're back to Pratchett again, and I had very little idea about what could be expected in Moving Pictures. Judging from the title, there was a pretty good chance that it would be movie-related in some way, but considering the largely traditional fantasy trappings, I wasn't quite sure how that would pan out. 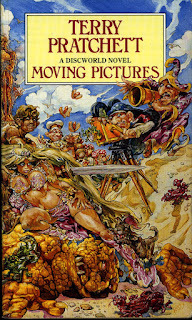 Moving Pictures follows Victor Tugelbend, a student wizard who has been studiously avoiding passing his wizarding exams in order to maintain his life of leisure. But when a group of alchemists develop a process for filming and displaying moving pictures, he finds himself swept up in the furore of Holy Wood, new home of the "click". He soon finds that there is something unnatural about Holy Wood and the clicks, and he determines to find out what it is in between takes. So, the good but obvious stuff first. Pratchett's writing and humour is top-notch as usual. That he appears to be both pandering to cinephiles with an abundance of movie references (made appropriate to the Disc of course), whilst also being at his most intensely scathing about the whole fame thing only makes this more entertaining. I think the best thing about Moving Pictures is the way that the subject of fame is tackled. On the one side, there is Victor and his co-star Ginger, who are trying to get their heads around the idea that they are suddenly important for no reason other than who they are, or at least who they can convince others that they are. This is compounded by the two wonder dogs, Gaspode and Laddie. Gaspode is a dog gifted with intelligence and speech by Holy Wood's magic, but Laddie is the one everyone assumes is smarter because he looks the part of a wonder dog. I rather liked the talent vs luck/looks vibe that the book tackled, because usually stories set in the world of movies likes its audience to assume that of course actors are more than just the right kind of pretty face for the era. The characters were a bit of a mixed bag. I liked seeing more of Cut-Me-Own-Throat Dibbler, and I look forward to seeing more of Archchancellor Ridcully and the Bursar. The two mains were a bit on the bland side though. I don't know whether that was meant to be some kind of commentary on vacuous actors, but it would have been nice to have a bit more personal motivation instead of being constantly prodded into action by the talking dog. Finally, the pacing is a bit odd. Not necessarily bad, but it does seem to have a lot of build-up and then a rather sudden climax. I didn't mind it so much, but I could see it being more distracting for those who were perhaps not expecting it.